OMEGA blind bolt mandrel. This Omega Technologies' blind bolt mandrel replaces the Hi-Shear® blind bolt blind nut installation mandrel version. The Omega blind bolt and Omega blind nut assembly tooling consists of a power unit and driving tool or gun. Blind nut assembly tools require changing out the anvil chucks or mandrels due to wear. The most commonly replaced component is the blind bolt mandrel. Omega blind bolt mandrels are manufactured to last in the toughest work environments. The OMEGA M2.5-518 Blind Bolt Mandrel is one of thousands of quality tooling products available from MRO Tools. Please browse Blind Bolt Mandrels for tools similar to the OMEGA M2.5-518 Blind Bolt Mandrel. 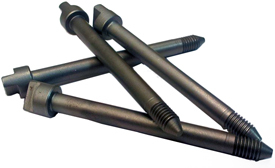 OMEGA M2.5-518 Blind Bolt Mandrel description summary: OMEGA blind bolt mandrel. Replacement for Hi-Shear® blind bolt blind nut installation mandrel. Diameter: 0.310 Length: 4.50 Quantity discounts may be available for the OMEGA M2.5-518 Blind Bolt Mandrel. Please contact MRO Tools for details.